In the early hours of Easter Sunday morning, I gave birth to a perfect little girl, Rhiley Kim Bennett, weighing a whopping 10lbs 8oz. Rhiley’s daddy, Richie, and I were over the moon. Our little family was complete and we could not wait for Rhiley to meet her 11 month old sister Lily. Until 10 May 2014 Rhiley was the happiest, most adorable, funniest little girl you could ever meet. She only ever went to the GP for her baby jabs. She was healthy. While Richie worked all week; I spent every day having girly time with my two girls. They were my world, my best friends. On 10 May 2014 we all went to Pagham for a week’s holiday, to take our two girls to Peppa Pig World. For the first few nights Rhiley was crying. We thought maybe she was teething and so I rushed around trying to find teething gel. On 14 May, we spent a fun-filled day at Peppa Pig World. But later that afternoon Rhiley was lying in my arms crying again. By the end of the holiday she was struggling to walk. When we returned home we took Rhiley to the Walk-in Centre at our local hospital. We explained her symptoms; the doctor thought that she had an infection and prescribed antibiotics. 22 May: Rhiley by now was not weight-bearing on both legs, not eating, not drinking and still crying. I took her straight to the GP and he prescribed suppositories because he thought she had severe constipation. By 25 May, Rhiley was screaming in pain. We took her straight back to the walk-in centre. Six hours later and the doctor prescribed a further course of antibiotics. Our big question was how can a two year old be screaming in pain and it only be an infection? On 3 June, three weeks and three days after her symptoms had begun, a consultant finally gave Rhiley MRI scans, an X-ray and an ultrasound. He then explained that they had discovered a growth at the tip of Rhiley’s spine and that an ambulance would come to take us to another hospital – a specialist treatment centre. I burst into tears. I then had to make the worst phone call of my life, to let Richie know. 4 June at 10:30am: Rhiley cuddled her blanky and had sleepy medicine. 9:10pm – me and Richie were called to see Rhiley. The surgeon told us he had removed as much of the tumour as he could but that it had spread – it had grown on Rhiley’s nerves and had grown in her brain and all along her spine. Seeing Rhiley is all we wanted to do, but seeing her hooked up to all the machines was devastating. The surgeon advised us that Rhiley may never be able to walk again. The following eight days were the most nerve racking, upsetting and exhausting. Waiting to hear what type of tumour Rhiley had felt like a lifetime and we had to take care of both our girls 24/7 in hospital. On 12th June we found out that Rhiley’s tumour was called ATRT (Atypical Teratoid/Rhabdoid Tumour) a rare type of central nervous system tumour mainly affecting children under three. We’d had enough, we wanted to go home with our two girls. Our happy little family life came crashing down around us. Why Rhiley? 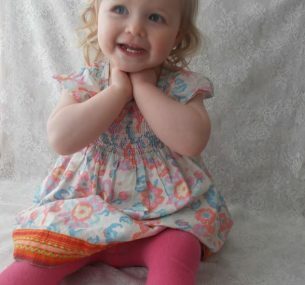 On 19 June Rhiley was due back at hospital to have a Hickman Line inserted into her chest. She endured three months of chemotherapy; no-one knew if it was even working. In the meantime we had to watch her feeling sick, losing all her weight and we found ourselves hoovering up her beautiful blonde hair as it matted and fell out. Rhiley always said “Daddy cut it”. Nurses visited Rhiley once or twice a week and Rhiley would shout “no nurses” with her grumpy frown. We could not have been happier when, one evening, Rhiley held onto her pink Mini Cooper ride-on and took her first three steps across the room. She was proving everyone wrong. On 23 September, Rhiley had an MRI scan to determine whether the treatment was working or not. We were all worried sick about the results. One week later we finally received great news. The tumours were reacting to the chemo and in particular the largest of the tumours on her spine was now down to 7mm. Rhiley was getting her strength back and eventually was given a walking frame to help her walk further. November 2014 was a great month, Rhiley was happier than ever. She had also taught herself how to walk again unaided, even though she was paralysed from her left knee down. She learnt how to walk with a splint on her leg. She was one tough little cookie! 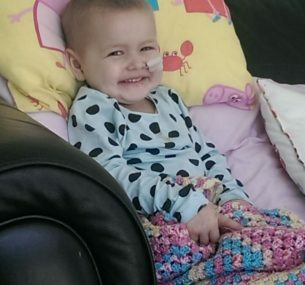 10 November, Rhiley underwent stem cell harvesting ready for the six weeks of high-dose chemo due in January 2015. Rhiley smashed it, she not only gave them the six million stem cells they were after, but in fact had given them 11 million in four hours and then went straight onto another 48 hours of chemo, she was amazing! On 3 December, Rhiley underwent what should have been her last MRI scan before high-dose chemo. We weren’t worried this time, we had seen Rhiley prove everyone wrong. But one week later we received the news that Rhiley’s largest tumour had grown slightly and two new spots of tumour had grown on her neck. The consultant called for a further scan. So on 23 December Rhiley was put to sleep again. We were worried sick and shaking. Whilst every other family was getting ready for Christmas day, we received a call with the news that Rhiley’s tumours were now fighting back. She had 12 parts of the tumour just in her brain. All me and Richie could do was put on our happy mummy and daddy faces and take our girls outside to sprinkle reindeer food and see Father Christmas fly by. We made it the best Christmas ever. Rhiley and Lily enjoyed opening lots of pressies and they changed outfits from pretty white fairies, to fluffy Olaf onesies, to cowgirls with guns. Rhiley loved the fact she was able to stay at nanny and granddad’s house for the first time. On 7 January 2015 we drove to the hospital to hear what her consultant had to say. That day seems a blur. While we watched Rhiley laughing and playing with her sister we were told that if we made the decision to put her through high-dose chemo or radiation treatment, there was a big possibility she would pass away either during or after. The consultant explained that it would be a miracle if this type of tumour did not return within months, if not weeks. We drove home, heartbroken, crying. We did not have a choice, Rhiley’s little life was being taken away from us. We knew only one thing – that time was now ticking and we had to make sure we spent every day together. 9 March 2015: Rhiley had her sleepy medicine along with her blanky for five days of radiation to her spine. She was unable to sit up straight without pain. We celebrated Rhiley’s third birthday, 8 April 2015, on Looe’s beach, Cornwall. Rhiley in her Elsa dress eating cake and with princess balloons on the beach she was happy and smiling. Two days later Rhiley wasn’t herself. She kept saying “go home now”. It hit us hard that something wasn’t quite right. She caught E-coli and on 14 April was only able to sit up with cushions. She was unable to move her legs, neck or back. Rhiley being Rhiley still smiled beautifully every time. Rhiley took her last breath in mummy and daddy’s arms at 4:56am on 23 April 2015. Two weeks after her third birthday, one week before Lily’s fourth birthday, she grew her pretty princess wings.